Judith Jamison joined Alvin Ailey American Dance Theater in 1965 and quickly became an international star. Over the next 15 years, Mr. Ailey created some of his most enduring roles for her, most notably the tour-de-force solo Cry. During the 1970s and 80s, she appeared as a guest artist with ballet companies all over the world, starred in the hit Broadway musical Sophisticated Ladies, and formed her own company, The Jamison Project. She returned to Alvin Ailey American Dance Theater in 1989 when Mr. Ailey asked her to succeed him as Artistic Director. In the 21 years that followed, she brought the Company to unprecedented heights – including two historic engagements in South Africa and a celebration of the Company’s 50th anniversary with a 50-city global tour and a year-long series of special performances, collaborations, events and commemorative merchandise including the photographic book Ailey Ascending: A Portrait in Motion and an Ailey Barbie® Doll by Mattel that she designed. Ms. Jamison is the recipient of numerous awards and honors, among them a prime time Emmy Award, an American Choreography Award, the Kennedy Center Honor, a National Medal of Arts, a “Bessie” Award, the Phoenix Award, and was presented the Handel Medallion by Mayor Bloomberg, the highest honor awarded by the City of New York. She was also listed in “The TIME 100: The World’s Most Influential People” and honored by First Lady Michelle Obama at the first White House Dance Series event. In 2013, Ms. Jamison was the 50th inductee into the Hall of Fame at the National Museum of Dance. As a highly regarded choreographer, Ms. Jamison has created many celebrated works, including Divining (1984), Forgotten Time (1989), Double Exposure (for the Lincoln Center Festival in 2000), HERE . . .NOW. (commissioned for the 2002 Cultural Olympiad in Salt Lake City), Love Stories (with additional choreography by Robert Battle and Rennie Harris, 2004), and Among Us (Private Spaces: Public Places) (2009). Her 1996 ballet Sweet Release featured original music by Wynton Marsalis and Reminiscin' (2005) was inspired by great female jazz artistis and Edward Hopper's famous painting Nighthawks. In 1993, Ms. Jamison created Hymn as a stirring tribute to Mr. Ailey, which was the centerpiece for the Emmy award-winning PBS "Great Performances: Dance In America" special, A Hymn for Alvin Ailey. Ms. Jamison’s autobiography, Dancing Spirit, was edited by Jacqueline Kennedy Onassis and published in 1993. In 2004, under Ms. Jamison’s artistic directorship, her idea of a permanent home for the Ailey company was realized and named after beloved chairman Joan Weill. Ms. Jamison continues to dedicate herself to asserting the prominence of the arts in our culture, and she remains committed to promoting the significance of the Ailey legacy – using dance as a medium for honoring the past, celebrating the present and fearlessly reaching into the future. December 12, 2016 – On the heels of Alvin Ailey American Dance Theater’s joyous New York City Center holiday season, Artistic Director Emerita Judith Jamison will teach an exclusive Ailey Classics Workshop on Thursday, January 5 at 7:00 p.m. to celebrate what would’ve been Alvin Ailey’s 86th birthday. Ms. Jamison will impart Ailey’s signature style, which changed the perception of American dance around the world, showing audiences that dance can truly be an expression of the spirit. Bristol-Myers Squibb Company (NYSE: BMY) today announced the 10 first-place winners of the 2011 REYATAZ “Fight HIV Your Way” contest. The contest uses the power of words and visual arts as a platform to help raise awareness and lessen the stigma surrounding HIV. America's cultural ambassador celebrates 50 years of Revelations in Norway, Russia, Germany and Switzerland. 10-week tour will mark passing of Artistic Director mantle from Judith Jamison to Robert Battle on July 1 in Moscow, where Company launches "American Seasons in Russia" program under auspices of U.S.-Rissia bilateral presidential commission. When you're offered a chance to take a class with Judith Jamison, you don't say no.The company's beloved artistic director emerita rarely teaches open classes. But to celebrate the legacy of Alvin Ailey on what would have been his 87th birthday, she gave a special two-hour workshop at the Ailey Extension on Friday night. 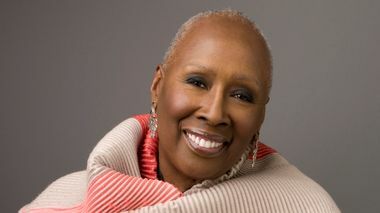 Judith Jamison is the Former Artistic Director Emerita of Alvin Ailey Dance Theater. Yesterday would have been Alvin Ailey, the founder of Alvin Ailey Dance Theater, 86th birthday. To celebrate his legacy, Ms. Jamison taught a Ailey Classics Workshop at the Ailey Extension.